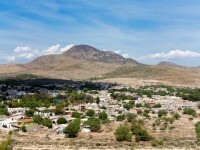 This colonial city on the Mexican Bajio region features a great number of industries related primarily to the chemical industry and auto parts, settled in two large industrial parks: Valle de Aguascalientes Industrial Park and Industrial City, the latter located in the south of the city. In Aguascalientes, there is also a large textile industry with important national groups dedicated to the manufacture of clothing and appliances, such as Levi's, JoBar Group, and Tenidos San Juan. To see the main attractions of the city, you can take a tour by Plaza de Armas and visit the Government Palace, the only civil building built in the 17th century that still survives in Aguascalientes. Although it was remodeled in different occasions, the palace preserves much of its original design and baroque decoration. Marvel at the colorful murals inside this building, created by the Chilean artist Osvaldo Barra Cunningham, a disciple of the famous Mexican painter Diego Rivera. Another place you cannot miss is the House of Culture, behind the cathedral, which serves as headquarters of the Cultural Institute of Aguascalientes. A short distance away, you can discover Teran House, an old mansion converted into a cultural center with a small outdoor theater. Here, you will also find several museums including the National Museum of Death, which exhibits works related to the vision of death in Mexico; the City Museum and the Jose Guadalupe Posada Museum, where you will learn a little more about the work of this local artist. 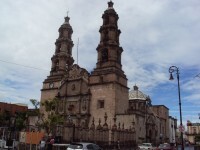 Aguascalientes is the third city in Mexico with the highest number of Catholics, so the community has a variety of religious buildings including the Temple of Our Lady of Guadalupe, the Temple of Saint Anthony, the Temple of San Marcos, and the most important, the Cathedral of Aguascalientes, dedicated to Our Lady of the Assumption, patron saint of the city, with a beautiful interior, which keeps the remains of Don Juan de Montoro, founder of the city. 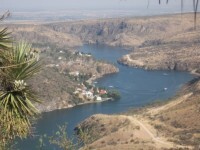 In late April and early May, Aguascalientes hosts the San Marcos Fair, considered the most important of Mexico. Besides the fair events such as the coronation of the Queen or the bullfights, a different country and Mexican state are invited each year to show their culture and gastronomy. Another celebration is the Festival of Skulls in late October and early November in honor of Jose Guadalupe Posada, drawer and painter born in Aguascalientes, famous for being the creator of the world famous Calavera Catrina. The most memorable spectacle of this festival is the Parade of Skulls, with hundreds of costume characters touring the city. Your visit to Aguascalientes will not be complete without visiting the Tres Centurias Park, a space including green areas and the old buildings of the railway station. Today, these buildings house the Tres Centurias Railroad Museum, named after the structures corresponding to the different centuries: 19th, 20th, or 21th.